We have given you some tips for creating kitchen space in previous posts, and today we will focus on one of the best space saving inventions for any kitchen. Lazy Susans are simple devices that can turn wasted kitchen into prime storage area. A Lazy Susan is simply a rotating tray. In the kitchen, a Lazy Susan will usually be a round tray with a small railing or lip around the outside. So how does a Lazy Susan create space in your kitchen? Because Lazy Susans rotate, all of the items stored in the back of cabinets can easily be brought forward to the front of the cabinets. Consider how often you use those “back cabinet” items. Do you even know what is stored in the back of your cabinets (when I installed Lazy Susans in my kitchen, I couldn’t identify some of my “back cabinet” kitchen tools)? Lazy Susans turn all of your cabinet space into “front” cabinet space. If you never dig to the back of your cabinet for those inconveniently stored items, then you effectively double your kitchen storage when you install Lazy Susans! The biggest advantage to having Lazy Susans, though, is for corner cabinets. Digging into the back of corner cabinets is more than inconvenient, it is often impossible. A Lazy Susan will turn that corner cabinet inside out! A simple spin of the tray gives you easy access to everything stored in your corner cabinet, turning those corners into great storage spaces. In many kitchens, corner areas are considered dead space and do not have cabinets installed. 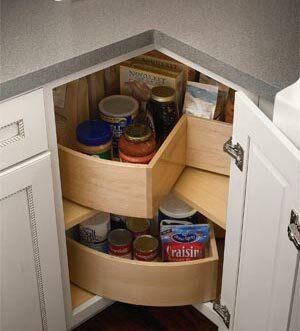 But with a Lazy Susan you can transform any corner into a handy and accessible cabinet. If you need to create more storage space in your kitchen, or simply want to permanently organize your existing cabinets, think about what Lazy Susans can do for your kitchen. Outer Banks Custom Kitchens is your place for kitchen cabinets in Hatteras . Call us to discuss your plans and desires for your Outer Banks kitchen remodeling. With 50 years of experience on the beach, from Ocracoke to Corolla, Outer Banks Custom Kitchens can give you the kitchen of your dreams.